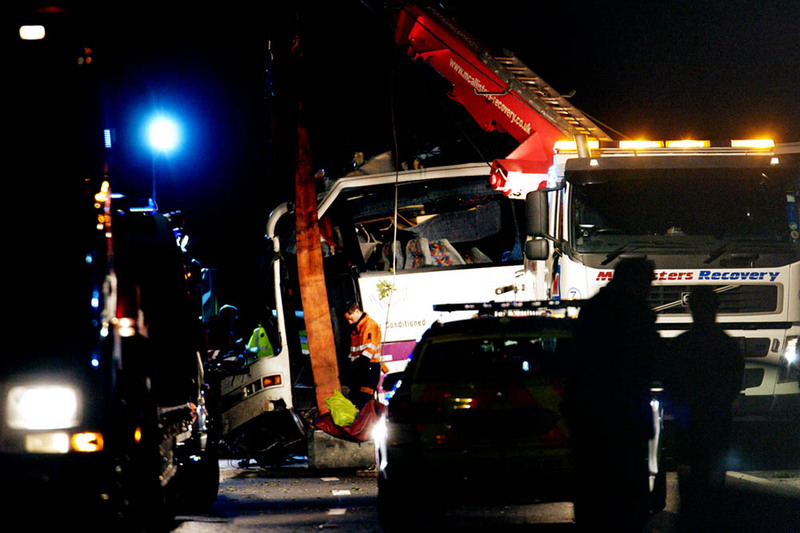 Recovery of the Coach involved in a fatal accident on the A3 south of Guildford, taking festival goers back to Merseyside[/caption]That was different, actually it wasn’t is was moreof the same, hours standing around or yomping miles for no result. The first job of the day was to search out a film set, which was unsuccessful, then as I realised that the Coach involved in an accident that resulted in three fatalities wasn’t going to be cleared anytime soon, I headed to the scene of the accident. I arrived at a little after lunch, and finally left the scene at 22.30. with a few frames in the bag. I was surprised that I was the only stills photographer there, surrounded by ENG teams. And not single one of them offered me a brew, miserable gits. Anyway, too late for any shows in the nationals tomorrow, but they are now wired and I am having a pint.